Dove has been my body and face soap of choice since I was 16 and the dermatologist who treated my (second degree) burned face and hands recommended it. I’m not one to recommend you pack a year’s worth of your favorite soap. I had two bars of Dove left when I packed so, happily, I was able to fit them into my backpack/suitcase. After that, I knew I would simply use what I can find. I’d done that before, each time I’d traveled. 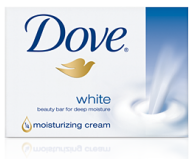 The thing is, despite claims, no other soap in the US or elsewhere, is a creamy, soft, and residue-less as Dove. So when I ran out I missed Dove. I found some in Walmart in San Salvador. They were the smaller sized bars, but the price wasn’t too horrible. However, they didn’t last long. At home, sometimes you can find them at the 99 Cents Only Store (a west coast chain). At Costco in the USA, you can buy 16 4-ounce bars for $18.81. That’s $1.17 each. Here… I wondered if I’ll get to the big box store. Today I picked up a package of stuff from home. I’d suggested to my friend Mark that if there was room in the Priority Mail box he was sending to me (via a friend) that I’d love some 99 Cents Only Store Dove. Today I have 10 bars! I really have to take a photo to show the proportion of soap to space within my pack. :) But I will somehow fit these in. It is just so cool that my friend sent them. ← Easier travel between USA & Brazil coming?